I’m taking part in Hertfordshire Open Studios this year as part of a mixed media show with five other artists at the Old Courtroom, St Albans Town Hall, Market Place, AL3 5DJ. Trains from London St Pancras to St Albans take about 20 minutes. The show is open from 6th to 28th September, Wednesday to Sunday (not Sunday 7th), 11am to 4.30pm. The firing temperature for these painted pieces is critical: the colour has to melt but not to run, and the temperature in my old electric kiln varies by 25˚C from top to bottom. The answer is to re-wire – but not when you have a lot of work to finish for a show. So in the meantime I have to average and hope the top shelf isn’t underfired and the bottom shelf isn’t overfired. 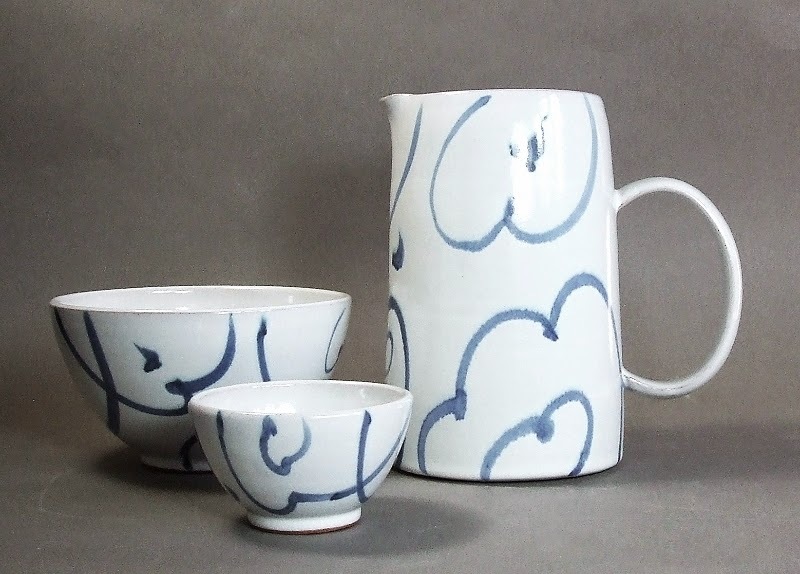 My inspirations are varied – obviously the long history of blue and white pottery, both tin glazed and porcelain, but also the painted pottery that came out of Stoke-on-Trent from the 18th to the early 20th century. In the 19th century, expensive freehand painting was being replaced by transfer printing and filling-in, but progressive and artistically-minded manufacturers resisted the trend. They were helped by the craze for pottery painting between 1870 and 1900. In the 1870s Minton’s developed their art pottery studio in close association with the South Kensington art training school (later the Royal College of Art); in the next decade Doulton’s of Lambeth employed local art school graduates to decorate their salt-glazed pottery; and at the beginning of the 20th century there was a fruitful partnership between W.R.Lethaby, Cecil Wedgwood and Alfred and Louise Powell. Wedgwood, unlike many other manufacturers, commissioned designers from outside the company and developed links with art schools. In 1902 he asked Lethaby to recommend a suitable designer and Lethaby introduced him to the Powells. Fortunate in finding a director receptive to their Arts and Crafts approach, the Powells had a strong influence on Wedgwood’s ceramics for many years. In the 1930s there was a vigorous debate about the importance of art in industry. The 1935 Victoria and Albert Museum’s exhibition English Pottery Old and New demonstrated good design with both industrial pottery and studio pottery. Gordon Forsyth’s book Twentieth Century Ceramics (1936) covered hand-made and factory-made pottery without discrimination, and Dora Billington took a similar approach in The Art of the Potter (1937). After the second world war, a few British tableware manufacturers imitated studio pottery, and in Scandinavia there was lively hand painting in pottery factories – notably by Stig Lindberg, whose work is much sought after today. The Italian tradition of mass-produced, hand-painted pottery is very much alive. But in Britain there has been a parting of the ways between the factory and the studio, which I think has been unfortunate for both.